ㆍMoisturizing formula that lasts all day. ㆍRoyal Jelly, Vitamin, mineral, oil, and herb extracts nourish and protect the eyelashes from unwanted contamination. ㆍCoates each lash evenly for a great look that lasts. ㆍMakes lashes look fuller and thicker without clumping. 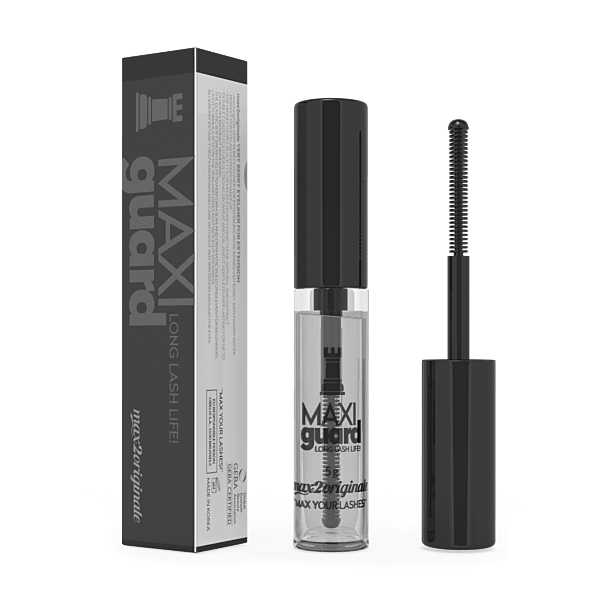 MAX2LASH ORIGINALE SPECIAL MASCARA GOLD IS REGISTERED ON THE FDA. This premium quality water washable mascara is compatible with eyelash extension and natural lashes. Royal jelly and herb extract nourish and protect the eyelashes. Moisturizing formula coats each lash evenly for a great look that lasts all day. Allow 24 hours after eyelash extension procedure before applying. Gently brush up evenly. Remove with soap and water. Do not use max2 Lash Royal Volume-up Mascara if you are over sensitive or allergic to this product. Do not use max2 Lash Royal Volume-up Mascara if you have any disorder or open wound around the eye. Keep away from children. Avoid direct sunlight.